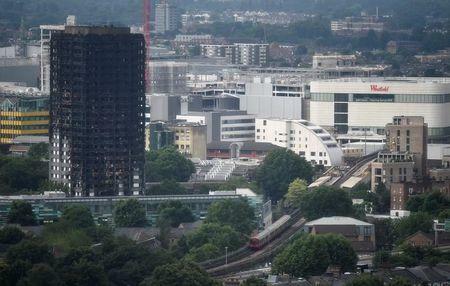 LONDON (Reuters) - The head of the local council in the London borough where at least 80 people died in a fire in a social housing tower block resigned on Friday after he was criticised for the organisation's handling of the disaster. "As council leader, I have to accept my share of responsibility for these perceived failings," Nicholas Paget-Brown, the leader of Kensington & Chelsea council, said in a statement. He acknowledged criticism of his decision on Thursday to suspend a council meeting on the June 14 disaster at Grenfell Tower when media attempted to follow proceedings, something he said was necessary to avoid compromising a public inquiry. A spokeswoman for Prime Minister Theresa May earlier on Friday criticised the decision to try to hold the council meeting in private. "It cannot be right that this should have become the focus of attention when so many are dead or are unaccounted for," Paget-Brown, a member of May's Conservative Party, said. Britain named a former judge on Thursday to lead the inquiry into the inferno. Residents of the block want to know why the fire spread so rapidly and whether proper fire safety measures had been in place. They also want explanations about why their concerns had been ignored. May has also been widely criticised for her initial response to the blaze. Earlier on Friday, the government said 149 high-rise buildings have failed safety tests carried out after the fire at Grenfell Tower.